As you can see, my weekend started spectacularly when I had this pop up in my Twitter notifications. It’s really hard to follow that, but as it’s a long Bank-Holiday weekend here, I might as well try. So let’s get started! I’ve been playing a lot of Android games this week – I mean, more so than usual. My procrastination over the essay has continued, clearly! I have a Nexus 7, which I bought back in September last year, and use it primarily for looking at the interweb when I’m too lazy, or for playing games. When I first got it, I was primarily concerned with using it for stuff like Ticket to Ride, Carcassonne, Elder Sign: Omens, and Settlers of Catan. However, around Christmas last year I discovered the joy of Magma Mobile games on the Play Store, and I’ve pretty much been hooked since. First it was Octopus (how cheerful and cute do these guys look?! ), then Bubble Blast Rescue, and it’s just gone on from there, until now, when most of the tablet’s memory is taken up with these games! They’re all free, which is fabulous, but they’re also really really good! There’s a game called Dolphin, which is a nice and easy race game, where you basically have to avoid jellyfish and collect stars. As you can see, I’m a Super Dolphin, so yeah… Awesome! I also really enjoy the block breaker game Smash, which has both a challenge mode that takes you through a series of ten levels, and an ‘arcade’ mode which is basically a survival mode. My current favourite, however, is Flying Squirrel, which is precisely as whimsical as it sounds! 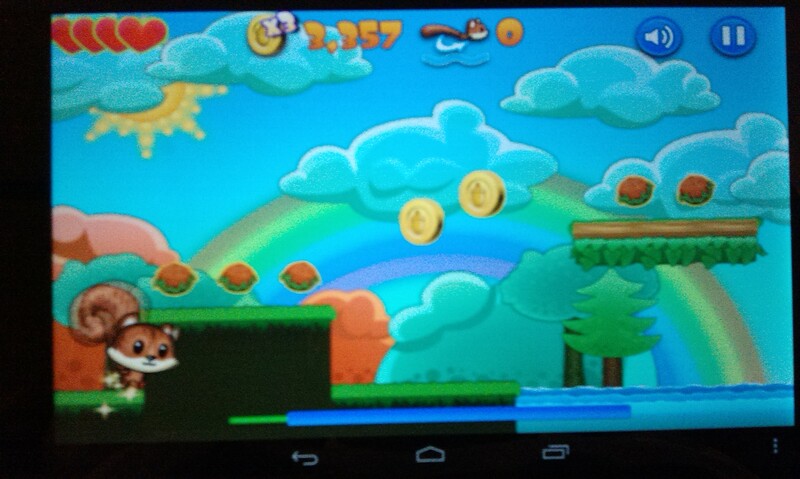 You control a squirrel, and you go around collecting coins and nuts. It’s basically a platform game, which is why I think I like it so much. Remember I said a whiles ago that I was never really a computer gamer? Well, I’m not, I’m much more of a tabletop gamer, but I do have a secret love of platform style games. Never a big one for just shooting stuff, I greatly prefer to hop about and collect useful stuff instead! Anyway, something else in Flying Squirrel’s favour is the Evil Toadstool, which basically negates any special effects you may have accumulated (such as the wings or the star), but makes a sneeze noise when you encounter it! Delightful! I can highly recommend it, anyway! Magma Mobile have got some really awesome games, and one of the best things about them is they’re free! Download them now and prepare to lose yourself in awesomeness! The essay has finally progressed, you’ll no doubt be thrilled to hear! Yeah, I finally put fingers to keyboard the other day, and I have currently got it to around 730 words. Not the most inspirational of starts, and I’m not entirely sure about the bulk of what I’ve written so far, but we can’t have it all, I guess… However, the exciting thing about this week was that I enrolled in the next module for my degree! As I explained a couple of posts ago, I’m doing a History with Classical Studies course, and as I’m drawing to a close on the history side of things, next up is, of course, classics. Exploring the Classical World will begin in October, and no doubt I’ll continue to procrastinate over the seven essays that are involved with that course, too! I read three short Star Wars stories this week, which you might be interested in. First of all, I read the four-part Side Trip, which first appeared in the Star Wars Adventure Journal that I have previously mentioned, but was reprinted in the Tales from the Empire anthology released towards the end of Bantam’s licence. The anthology is a collection of various stories from the Adventure Journal, with Side Trip forming its crowning piece. A joint effort between Timothy Zahn and Michael A Stackpole, it features an adventure with Thrawn masquerading as the bounty hunter Jodo Kast (a Boba Fett wannabe) on the planet Corellia. Stackpole’s pet character Corran Horn also makes an appearance, along with his dad Hal. The story is interesting, and ties in with Stackpole’s X-Wing quadrilogy published in the mid-90s. It’s a contentious point, but I no longer enjoy Stackpole’s work as much as I used to. The X-Wing books were really enjoyable adventures when I first came across them, and I, Jedi is an acknowledged classic of the mythos, but in recent years I find them to be a bit, well, boring. Corran Horn is probably the biggest problem here. I’ve come to feel that Corran is written like some of the worst kind of fan fiction out there – he’s smart, he’s funny, he’s heroic, he’s a great pilot, he’s a Jedi, he’s awesome, he’s generally better than everyone else, and forms the lynchpin for the whole story arc. I, Jedi in particular had me smarting, the way Corran is said to be better than Luke – Luke basically is a bit of a wimp and a dithering idiot in comparison. But I’m getting off topic. Corran used to work for the Corellian Security Force, of CorSec, before joining the rebellion, and in Side Trip we see him ‘on the beat’ with Hal. He’s marginally more tolerable in Side Trip than he is in I, Jedi, but the story is largely a favourite of mine because of the Zahn bookends. In addition, I read two of the Tales of the Bounty Hunters, those of IG-88 and Zuckuss & 4-LOM. In the 1990s, Bantam released three anthologies of short stories centred around crowd scenes in each of the three films: the Mos Eisley Cantina; the Bounty Hunters, and Jabba’s Palace. Kevin J Anderson, the author of the IG-88 tale, oversaw the project and managed to edit Jabba’s Palace into a nicely cohesive tale, in my opinion! Unlike Stackpole, I find Anderson’s work to be as whimsical and swashbucklingly enjoyable as the original trilogy was. His Jedi Academy trilogy, while largely criticized, appeals to me on many levels (it was also among the first Star Wars novels that I read). 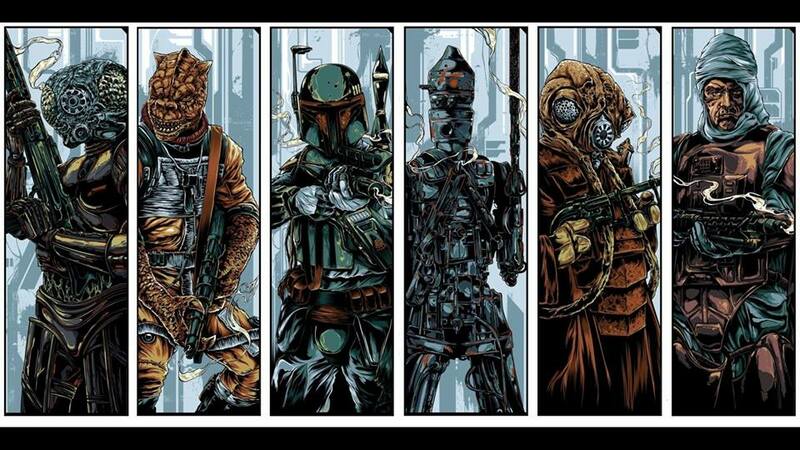 IG-88 is the assassin droid in the fourth panel in the above illustration. His tale is kinda hilariously over-the-top, and when taken in the spirit of “this is just a bit of fun”, it is really enjoyable! It does, however, feature an Imperial Supervisor who wants – a nose job. Seriously, he has a massive hooter and at one point asks Darth Vader to finance some rhinoplasty. I mean, seriously? But yeah, sit back and enjoy the ride, and it’s pretty entertaining. The tale of Zuckuss and 4-LOM (panels five and one, respectively) is much more serious. It deals with the final evacuation of the rebels from Hoth, including controller Toryn Far (“Stand by ion control. Fire!”), and sees Zuckuss and 4-LOM bait a trap to try to collect the Empire’s bounty on Han Solo using these rebels, but ends up with them defecting to the Alliance. Nicely written, I must say, with some really compelling character portrayals of some folks who were essentially set dressing for the movie! So tomorrow is May 4th, Star Wars day. I plan to make a special post to mark the occasion – look out for that one! Next Next post: Star Wars!